One School, One Book is nationwide program where teachers, students and administration read the same book over the summer before the school year begins with the intention of building a sense of community. This is the fourth year Voorhees Middle School has been participating in the program, and this past summer, they read “Howtoons: Tools of Mass Construction.” The book is about a brother and sister using everyday objects to invent toys that readers can build. The teachers took the program a step further this year by having the students create an object out of everyday items, just like the book taught them. On Oct. 24, some of those students presented their final projects to their parents and the Voorhees Board of Education at its monthly meeting. The reaction has been extremely positive throughout the community. “I always knew that our kids had the potential and the ability to really just blow us away, but I think I anticipated there being some resistance because the book was so different from what we’ve done in the past,” Voorhees Middle School librarian Stacey Fulton said. That resistance quickly went away once the students starting working on their creations. “We’ve had discussions with parents whose kids have anxiety about school, and they said they can’t get them to stop playing with their project and they’ve seen a different side of their children as a result,” Fulton said. The students who presented at the meeting were selected to show varied representation of creativity and ingenuity. Sophie presented her collar, and the app is being developed. She said she was happy to be a representative in front of the administration. Seventh grader Ethan Levy presented his cardboard projector and superhero images that can be displayed through it. 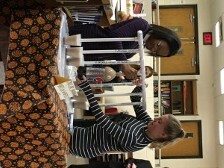 Eighth graders Taylor Swanigan and Madison Winfield presented their creation that allowed them to dispense six cups of soda at one time by utilizing PVC pipes, Mentos and a bottle of soda. Seventh grader Thomas Burns presented a Hoverboard with a wireless leaf blower. Sue Donnelly, coordinator of special projects for the Voorhees Township Public Schools, said the board loved being engaged with the students and having the opportunity to talk to them about their projects. One reason why Fulton thinks this project is so well received is because all students from various academic levels and backgrounds were able to contribute. “We had kids from the gifted classes to kids with special needs who participated in creating a project; that’s what made this so incredible,” she explained. “We were able to incorporate all of our students. If there was language barrier, there was no barrier to participating. Everybody, no matter what their circumstances were, could participate. It’s about our kids and what they are capable of doing.